Ok. It's a little too humid to spray guitars, and haven't really had the time anyway. I've been kicking around the idea of making my own pedals for years and finally took the plunge. 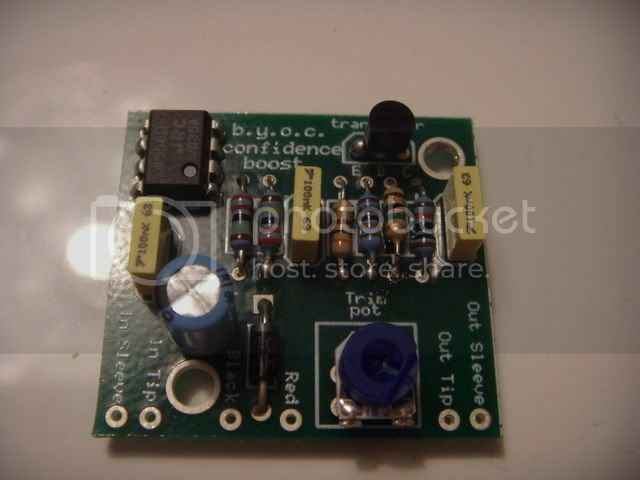 I ordered the BYOC (Build Your Own Clone) 250+ kit, which is supposed to be a clone of the old-skool DOD 250 Overdrive Preamp with the option to modify it to the specs for the similarly-old-skool MXR Distortion+ pedal. The circuits are nearly identical except for a few resistor values. I really wanted to try a good overdrive with my new/old Laney amp, so why not build one. One of many cool things about BYOC is when first-time customers order a kit, they throw in a very simple project called the "Confidence Boost". 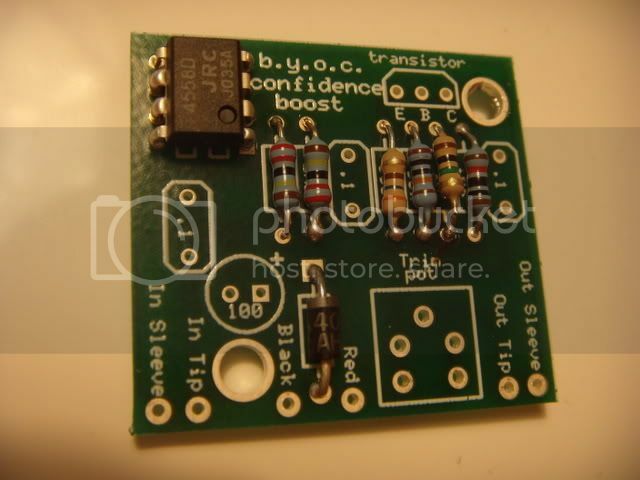 It's a very easy low-parts-count build for a linear boost circuit. It's a legit, useable effect but the kit that they give you isn't complete - no enclosure, on-off switch or knobs. 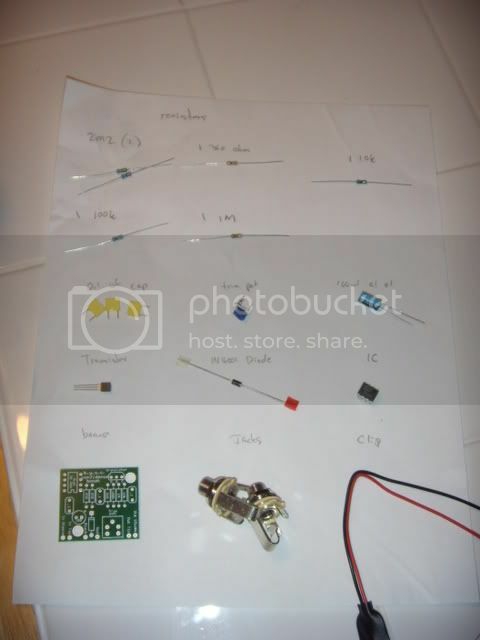 It's designed to get you familiar with the various components and more importantly, how to solder them to a printed circuit board and make the thing actually work. Easier said than done. The idea is to build the confidence boost first and if you decide that you hate soldering tiny components and can't deal with the teeth-clenching frustration when something inevitably goes awry, you send back the pedal kit you bought for a refund. It's a no-brainer. So that brings us to the Confidence Booster. 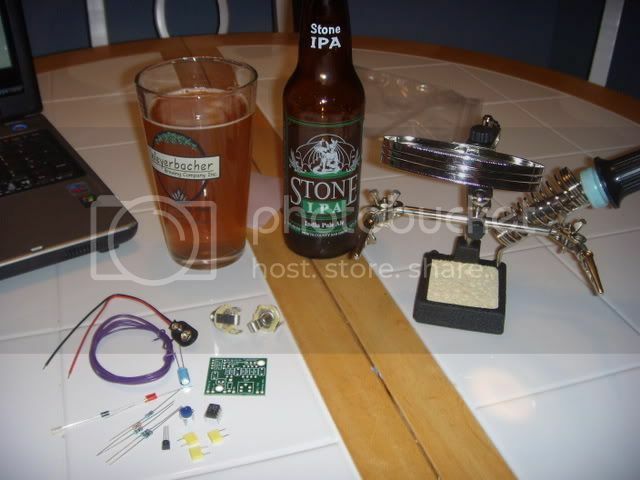 Here's where we start: A soldering station with magnifier and "helping hands", the kit components, and an essential and often overlooked part of any guitar project: a good IPA. Going off of the excellent step-by-step directions on BYOC's site, I organized the parts on a piece of paper. What I was not prepared for was the tiny size of these components. They looked much bigger in the pics on the site, but when you're holding a 2x2" circuit board and see about 60 tiny solder pads, it was my first "oh crap" moment. I got a lot of solder drip-through to the component side of the board, but eventually got the hang of it. 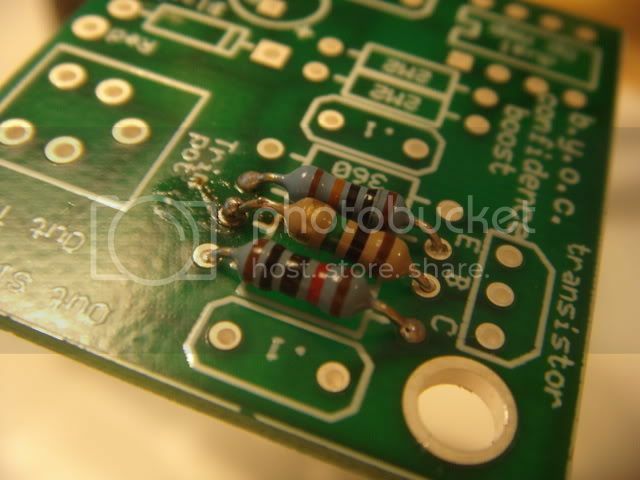 I never have soldered parts this small before and never on a PCB. For the second (middle) resistor I'd heat the joint on the back and apply solder and the solder would just disappear. So I added more, Same thing. Finally after doing this about 4 times I flipped the board over to see the resistor hanging almost vertically off the board with a huge blob of solder connecting it to the board. I laughed out loud - It looked like it would have worked fine, but I desoldered and started over, Screw-up #1 but not a show-stopper. 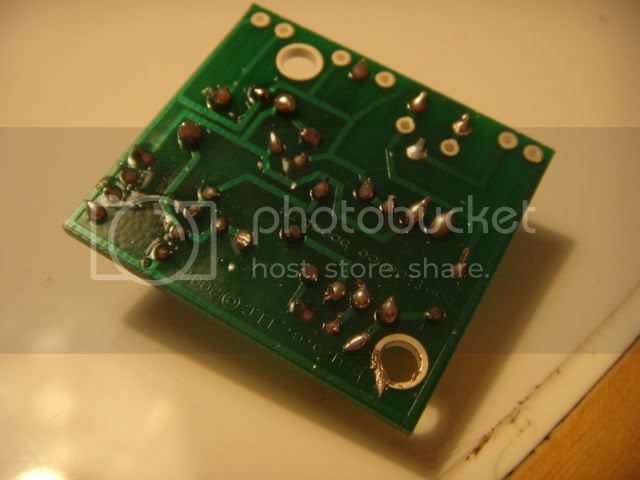 here's the board with all resistors, the diode and the IC. You can see some big blobs of solder poking through to the component side on the IC, but still making good contact as far as I can tell. It works!!!!!!! It more or less acted as a volume control for the baby Marshall, but when I plugged it into my Laney 50-watter it definitely boosted the signal and gave it a bit more gain, albeit compressed and a bit smushy on the bottom end. Sounded great with my Hiwatt wah.